Got to catch a stunning show on Friday featuring Lee Ranaldo, Steve Gunn, and Meg Baird just before succumbing to the winter cold that’s been making its way around Montreal… despite the preliminary throat-tickle that was creeping in, the night really stood out and proved to be one of the most memorable gigs in quite some time. Hope you’re all staying healthy & warm out there! This January Anastasia (of The Submissives fame) will be making a weekly pilgrimage down to CKUT to host If You Got Ears. They’ll be playing a mix of gnarly (and saccharine) pop music, leg-bouncing electronic jams, and abject synthpop: exploring the intersections where mainstream meets experimenta. Lucky listeners will experience the sonic equivalent of sitting under a vitamin D lamp. Expect guest appearances and live sets from weird and wonderful friends (and strangers), and the occasional sniffling/sneezing on-air as they attempt to survive flu season. 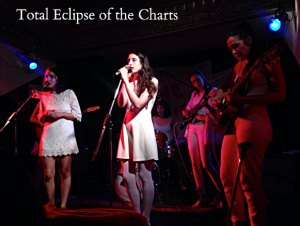 This entry was posted in Charts and tagged Lee Ranaldo, specialty charts, the submissives, total eclipse of the charts on January 20, 2017 by CKUT Music Coordinator. It’s been a whirlwind couple weeks – I was in Toronto for this year’s Polaris Prize (props to our hometown boy Kaytranada for his big win) then got back home just in time for Pop Montreal. There was too much awesome to recount here but a few personal highlights were catching Jef Elise Barbara as David Bowie, seeing an utterly captivating Annette Peacock performance, opening for legit heroes Psychic TV, the swoon-worthy Submissives (above) at the Egg Paper Factory showcase, and watching Toronto hip hop duo Bizzarh tear it up at beloved dive bar Brasserie Beaubien. I can already feel the post-pop sore throat kicking in so please send me yr favourite soup and/or immunity-boosting concoction recipes. Got IT skills? We’re hiring! Apply here and join the best crew in town. This entry was posted in Charts and tagged egg paper factory, Kaytranada, Polaris Prize, Pop Montreal, psychic tv, specialty charts, the submissives, top 30, total eclipse of the charts on September 29, 2016 by CKUT Music Coordinator.